Attention is invited to the subject & references cited above. 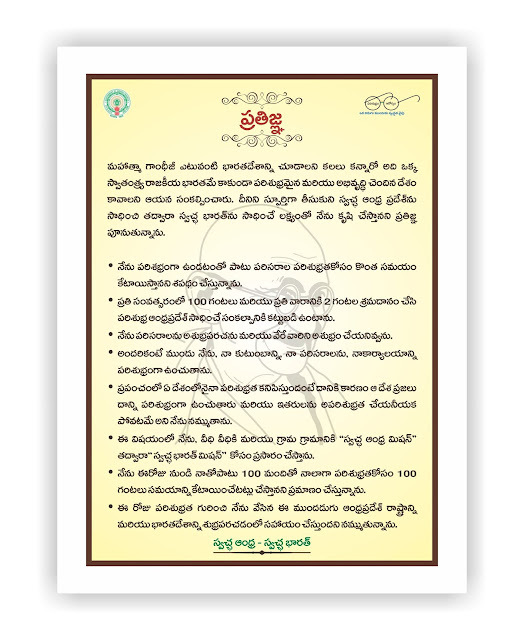 As an extension to Swachh Patashala – WASH activities in School, Cleanliness Month will be observed from 1st October to 31st October, 2015. All DEOs are the nodal officers at District Level and MEOs at Mandal Level for Swach Patashala. Head Masters at each school will be the Coordinators of the program at School Point. Nodal person at the School Point will be School Health Coordinators (PDs, PETs and Science Teachers who are already identified). A. School Level Activities: 1st to 10th October 2015 & 26th to 31st October. B. Home Level: 11th to 25th October, 2015 (During Short Term Vacation). All the DEOs are instructed to further instruct all the MEOs, Head Masters and School Health Coordinators at school points to conduct the following activities in schools as per the schedule given below for the students from 1st class to 10th class in all Govt/ Aided institutions. The activities indicated are only suggestive and HMs can take up any other activity/event which promotes cleanliness and Swach Patashala objective at their discretion. a) Pledge taking by all Teachers, Students and Non teaching Staff in the Morning Assembly. Pledge should be administered by Headmaster or School Health Coordinator of each School during the Morning Assembly (Ann-1). All students and Teachers’ will clean the classrooms to promote hygiene and dignity of labour. Painting/Drawing/Collage work on Cleanliness and Hygiene by students. Funds from School grant can be utilised for conducting the competition. All paintings need to be stored for purpose of inspection. Swachh Patashala cleaning campaign Min 1 hr to Max 2 hrs – Cleaning of School premises such as play ground, hand wash facility, toilets, disposal of waste materials, Digging of Soak Pits, replacement of broken mugs & buckets and so on. All students, Teachers and non teaching staff. HM/School Health Coordinators should identify the places in schools for cleaning and allot to different classes. All students, Teachers and non teaching staff. HM/School Health Coordinators should actively take up these activities. All teachers should allot and assign small projects related to WASH . Identified Short films will be sent to DEOs. Conduct of Gram Sabha/Mock Assembly by student Cabinets. Invite Local Elders for the mock assembly session. Personal Hygiene Day – Aarogya Club Members should reinforce good habits such as cutting nails, hair grooming, bathing and dental hygiene etc. Elocution/Essay writing/ Debate/ Quiz programs on Cleanliness, Hygiene and Sanitation.